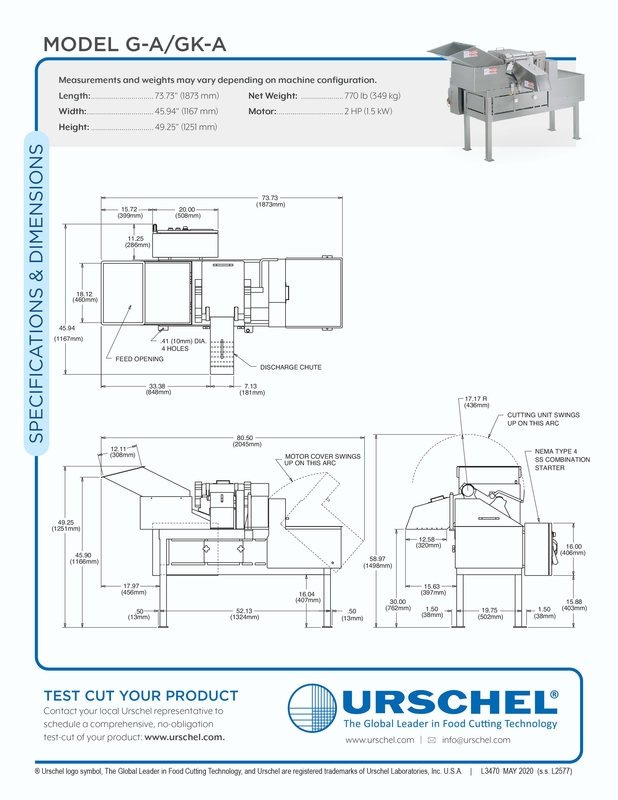 Model G-A & Model GK-A Dicers - Urschel Laboratories, Inc.
By checking this box, I affirm that I have read the Urschel Laboratories, Inc. Privacy Statement and GDPR Consent to Control of Personal Data. I understand my rights of privacy and give consent to Urschel to maintain the personal information I have freely given to it. 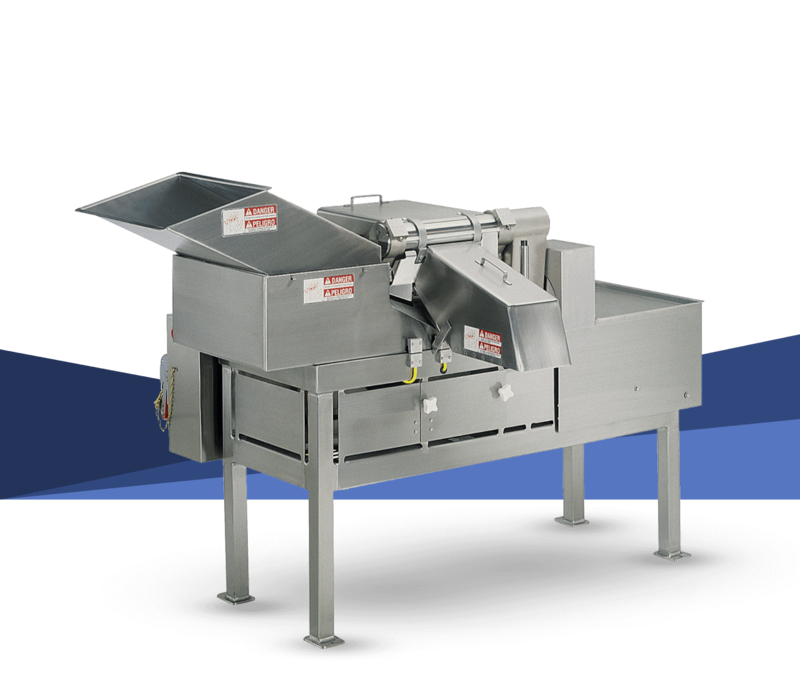 Both dicers accept a maximum infeed product of up to 5.5" (140 mm) in any dimension. The Model G-A Dicer produces flat dices or flat strip cuts. The Model GK-A Dicer produces crinkle dices or crinkle strip cuts. Both dicers are equipped with stainless steel product contact parts. Both machines feature continuous operation for uninterrupted production. 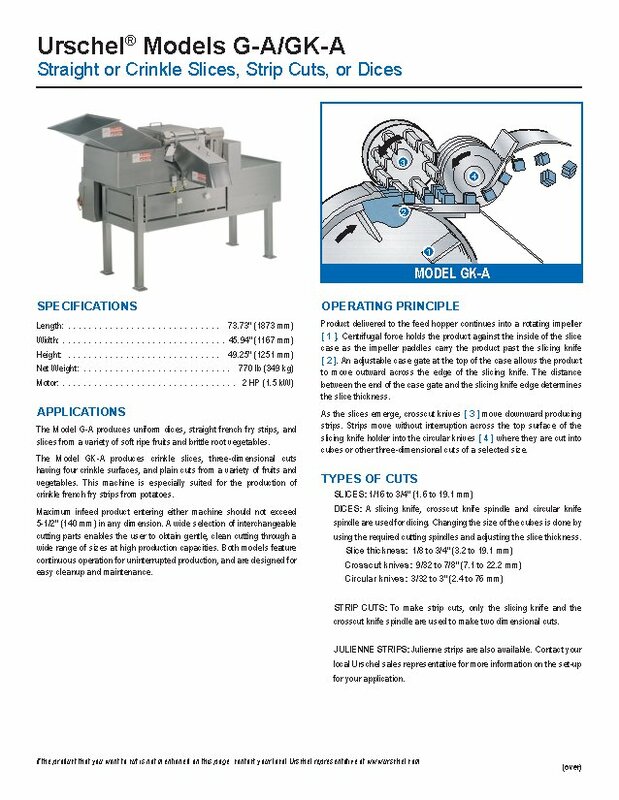 The Model G-A produces uniform dices, straight french fry strips, and slices from a variety of soft ripe fruits and brittle root vegetables. 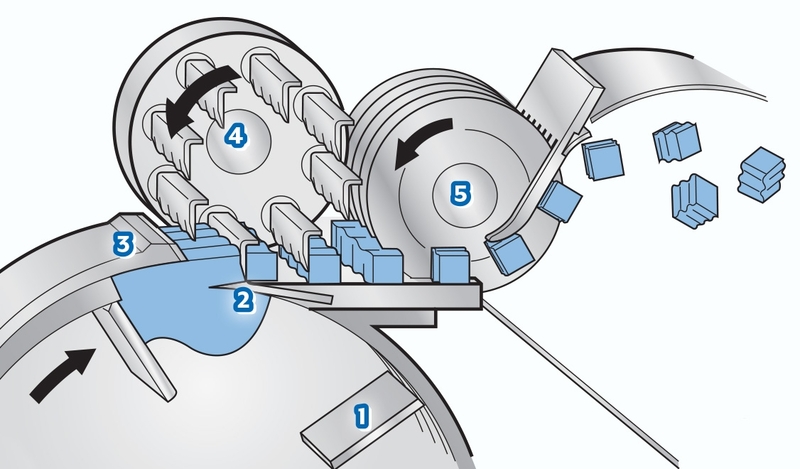 The Model GK-A produces crinkle slices, three-dimensional cuts having four crinkle surfaces, and plain cuts from a variety of fruits and vegetables. This machine is especially suited for the production of crinkle french fry strips from potatoes. Maximum infeed product entering either machine should not exceed 5-1/2" (140 mm) in any dimension. A wide selection of interchangeable cutting parts enables the user to obtain gentle, clean cutting through a wide range of sizes at high production capacities. Both models feature continuous operation for uninterrupted production, and simplified design for easy cleanup and maintenance. Product delivered to the feed hopper continues into a rotating impeller [ 1 ]. Centrifugal force holds the product against the inside of the slice case as the impeller paddles carry the product past the slicing knife [ 2 ]. An adjustable case gate at the top of the case allows the product to move outward across the edge of the slicing knife. The distance between the end of the case gate and the slicing knife edge determines the slice thickness. As the slices emerge, crosscut knives [ 3 ] move downward producing strips. Strips move without interruption across the top surface of the slicing knife holder into the circular knives [ 4 ] where they are cut into cubes or other three-dimensional cuts of a selected size. © 2019 Urschel Laboratories, Inc.